Does your deck need a facelift? Let professional deck staining experts in Michigan do the hard work, so you can kick back and enjoy your refreshed outdoor living space! Staining a deck of any size takes time and energy. Turn the work over to a professional deck staining company that has the tools and knows the tricks of the trade. Locally owned Fine Line Painting, a full-service painting contractor serving the Ann Arbor, Michigan, area since 1975, can complete the task quickly and effectively. You’ll be relaxing on your refreshed deck in no time. New deck staining prep. Brand new pressure-treated lumber is typically covered with mill scale, the material that settles on the wood during the milling process. Our professionals will remove this mill scale so the wood can accept the stain. And we won’t do the staining before the time is right: New deck wood should be left to weather and dry out for a few months before staining begins. Old deck staining prep. Older decks require quite a bit of preparation before staining. Our professional deck staining experts will remove the dirt, mildew, and discoloration that accumulate over time. You won’t have to worry about handling harsh strippers that could destroy surrounding vegetation or harm you or your loved ones. Fine Line Painting’s detailed prep work eliminates eyesores that could show through your deck’s new stain. Don’t worry about shopping for chemicals, sandpaper, power washers, brighteners, and all the other supplies needed to get your deck ready. 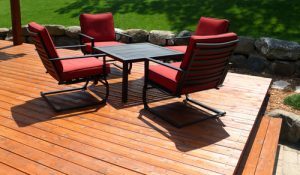 Let professional deck staining contractors in Michigan take care of everything. After your deck has been fully cleaned and prepped, we can begin staining. Fine Line Painting will provide the deck stain that you’ve selected. Not sure what to choose? We’ll talk you through your options. Every deck staining product is different, and it’s our job to guide you to the best choices for your unique deck. Which pigment and finish will look best? Does your deck need water-based or oil-based stain? How many coats are required? Will you need additional features, like mildew or mold prevention? Our experts will help you decide. Applying the stain – as professional deck staining contractors know best – can happen in any number of ways and depend on the surface being stained as well as the type of stain being applied. Fine Line Painting’s deck staining experts also know that staining vertical surfaces – like columns and railing – calls for special techniques to prevent spotting on the surrounding deck area. As tempting as it may be to use your newly stained deck, be prepared to wait a bit longer. Professional deck staining contractors know the importance of letting your stain dry completely before subjecting it to foot traffic, pets, and patio furniture. Our pros will let you know how long to wait. And we can also help you make the most of your deck staining investment – ask us how to prevent graying and fading to keep your deck from looking prematurely shabby. Ready for Deck Staining at Your Ann Arbor Home? Fine Line Painting experts can assess your needs and provide time and cost estimates. We’ll work with you to select the materials and stain best-suited for the age and condition of your deck. Accept our free estimate to get your deck staining project underway. A well-tended deck extends your home’s livable space. When you’re ready to make the most of your outdoor square footage, contact Fine Line Painting in Ann Arbor for a free deck staining estimate.